Drains the swamp of the lymph system of toxic residues. The hot compress to the chest and abdomen brings blood, nutrients and oxygen to underlying organs including the liver. The cold compress pushes toxins out of underlying organs. Hot and cold compresses applied to the back and spine affect abdominal organs through the nervous system. Increases liberation of white blood cells into the circulation. Sine wave machine gently stimulates muscle contraction and relaxation to assist with lymphatic pumping. 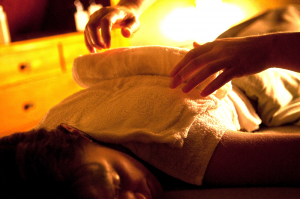 The person turns over and the same procedure is done with hot and cold compresses along the entire spine.